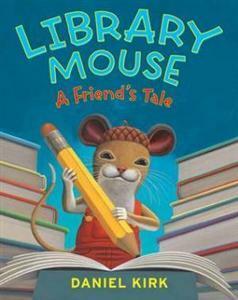 Sam is a library mouse who lives behind the children’s reference books, he writes and illustrates little books. Everyone loves the books he leaves on the shelves for them to find though they no idea who he is. One day the library’s Writers and Illustrators Club is given an assignment, to work with partners and Tom finds himself without a partner. He comes up with the idea of finding out who the mysterious Sam is. He hopes they may become friends, but if he finds out who Sam really is will Tom be able to keep Sam’s identity a secret? And will he finish his assignment? This is a wonderful story about shyness, friendship and seeing beyond outward appearances. There is plenty of text which makes it suitable for older (kindy age) children who aren’t yet reading by themselves but have longer attention spans. The illustrations are realistic, simple and somehow very appealing.